A business that "cashes-in" on the huge and growing mobile computing sector. It is a business that actually benefits from rapidly changing technology and the constant need for service and repairs. Mobile devices, smart phones, laptops and tablets are expensive for consumers to purchase as well as inconvenient and expensive to repair. You likely know people who have a device fail – or cracked a screen. 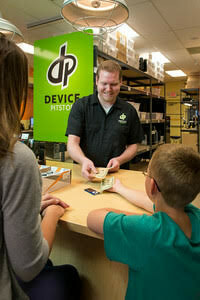 Device Pitstop® franchise stores re-sell high quality, certified, brand name used electronic devices of all kinds. We also have experienced technicians and parts on-hand to make speedy repairs with quick turnaround times. 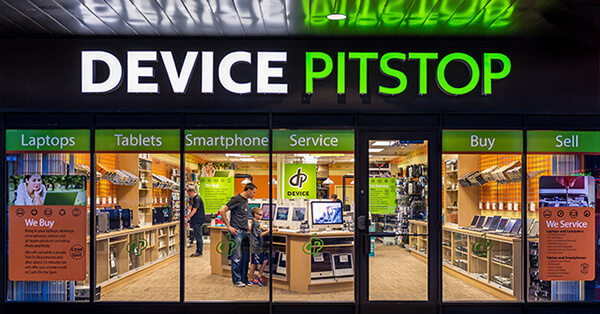 The stores have been designed for High volume with 4 technician repair stations in our store layout. We are not a one-man operation. We have a proven system that delivers a rush of customers to your front door with high gross margins. We provide the tools and support you need to execute your vision and successfully run your Device Pitstop. 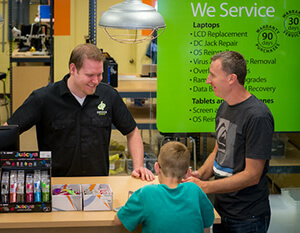 We are the only brand to combine computer retail and repair under one roof. We have 4 potential income sources for our franchisees. The Very BEST Value - in this "new economy," people are looking for ways to make their dollars go further - by shopping at Device Pitstop, they can get high-quality, name-brand electronics in great used or refurbished condition for the lowest possible cost...even lower if they bring in items to sell to us...think of it as a "trade-in." 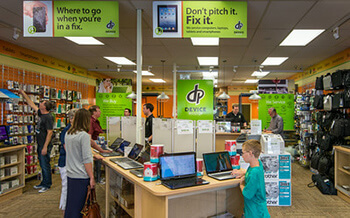 Superior Gross Profit Margins (GPM) - traditional retailers are lucky to get a 25% GPM - Device Pitstop is currently running at about 60% GPM - so for every $1 in sales, traditional retailers have 25 cents left over to pay bills with, whereas Device Pitstop stores have about 60 cents...that's a huge advantage. NO appointments needed - we buy all day, every day, right over-the-counter, up to 1 hour before closing. Proven Business Operating System – avoid years of trial & error -reduce costly mistakes -maximize the potential of this business much sooner -shorten your learning curve -stack the odds in your favor -How successful do you want to be? Proprietary Point of Sale System – specifically designed for the RESALE of electronics-automated touch screen BUY Matrix with categories & brands built in -bar coded price tags & integrated high speed credit card processing for faster customer service and far less human errors -this is an inventory management/cash flow tool that really helps you to measure and manage your business to its fullest potential -truly one of our most potent "secret" recipes. Full Comprehensive Training – we teach you the operating system so you can teach your managers and staff. 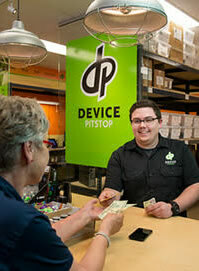 Store Opening Assistance -we have proven vendors in place to get you the best pricing and great service on everything you need for store design & build-out...including furniture, fixtures, equipment, interior/exterior signage, credit card processing, and proprietary Point-Of-Sale system. Professional Advertising/Marketing support – put your business on the map in a big way... even before your Grand Opening -professionally designed templates, materials and programs that can be customized to your business location, and promote your store on going -PRINT, TV, RADIO, WEB -present a professional face for your locally owned & operated business. On Going Support – because our royalty is a % of your sales, our success is directly tied to your success. So we are very motivated to assist you in on-going support throughout the life of your business. We assign you a field-support person to be your "small business consultant" -they see what you see in the POS system reports and can be very helpful to you in spotting opportunities to make corrections or maximize results -they are in regular communication with you throughout the life of your business. Financing & Business Planning – You will receive assistance in your preparation of a comprehensive business plan tailored specifically to the RESALE business model... and coaching on how to approach and speak with leaders. Most banks will want to see you put cash down equal to 25% to 35% of the total investment, and provide collateral assets of at least 50% of the amount you borrow. If needed, you can achieve financial qualification with the assistance of a financial partner or family member.